Hey everyone! Please help me welcome Lo to the show! You may know her from Facebook and Instagram! 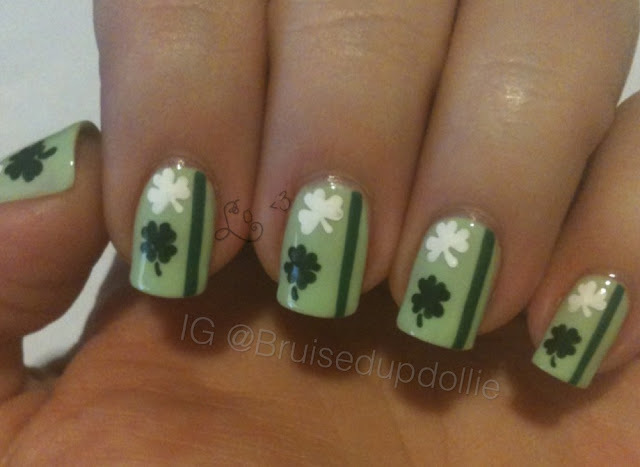 She's going to show you how to get this really simple and cute St' Patrick's Day look! 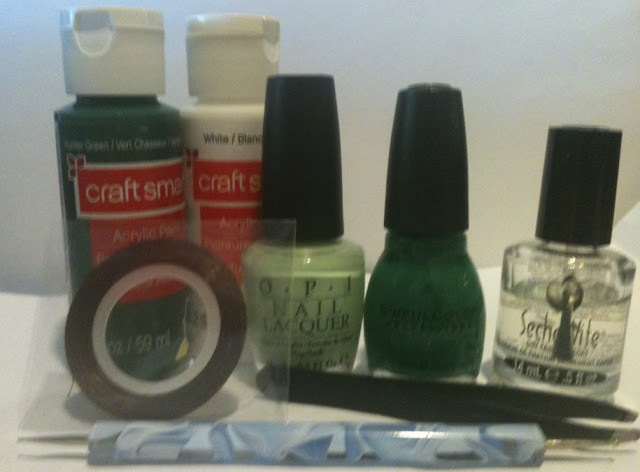 To achieve this simple and cute St. Pattys day manicure I started off with 3 thin coats of Gargantuan Green Grape by Opi. When that was completely dry I added two strips of striping tape to each nail and filled it in with Envy by Sinful Colors. After a little more waiting to dry time, I added one coat of Seche Vite. Since I used acrylic paints I didn't want my white to turn neon yellow from the green underneath. Once my top coat was dry I grabbed my smallest dotting tool and created the tiny clovers and shamrocks with white and green acrylic paints. This is really easy, just make tiny heart shapes that are connected to each other! Then when my paint had dried, one more layer of top coat and my look was complete! Thanks for stopping by Kat's blog to see my design! Follow me on Instagram for more of my nail art! Im so excited and honored to be a guest post! Thank you so much Kat for sharing my art! So cute!!!! Love this for March! Those clovers are so cute and they came out perfectly!